You see, for a going away party at work, we were all asked to bring something in for a lunch potluck. Normally I’m all over this kind of thing. I plan days in advance, I have written a recipe, and I’m bragging about what I’m going to bring. This time, I had nothing. I scrambled at the grocery store, picking up a loaf of rye bread, cheddar cheese from the deli counter, and turkey as well. Simple enough, but it seemed to be missing something. I knew there were a few frozen raspberries left in the freezer, and thought, hmmm maybe. But it all seemed like a podge hodge of items. I also realized I had no idea where the grill was, but oddly enough I had my waffle maker at my desk. Something I had left over from a company breakfast and kept forgetting to take home. 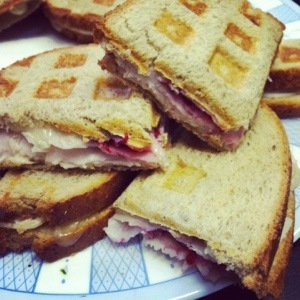 So I grilled the sandwiches on the waffle maker, stuffing each one with turkey, cheddar, and raspberries. The waffle maker actually made it easy to cut each one into four. And! Even though I used rye bread, I was told they came out pretty good! 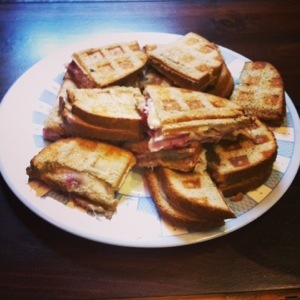 Guess I’ll keep experimenting with grilled cheese fillings.